AirCall, a service that provides a cloud-based phone system and calling, is preparing for full-scale launch in a bid to become a ‘Google Voice for businesses’. In essence, the service provides a single phone number for you to manage a number of different phones, making it ideal for, say, a sales or support team. Or indeed both, by providing one number for each team. It supports quick set-up of phone numbers for more than 40 countries without the need for changing any of your hardware and provides features to track who has been called back, assignment of calls, shared Google contacts, the ability to comment on calls and more. Of course, it’s by no means the first company in this market, but AirCall’s CEO Olivier Pailhès points out that many of the incumbents right now have come at it from a telco perspective, whereas it’s coming from a software background. It’s a huge market and you have many more players of course, but most of them have started with a ‘telecom’ mindset (building infrastructure and offering many features), while we’ve approached the issue from a software/SaaS perspective, trying to make a simple, carefully designed and collaborative product. Indeed, while services like Google Voice do already exist, Pailhès says that it’s not really designed for teams or business use yet. 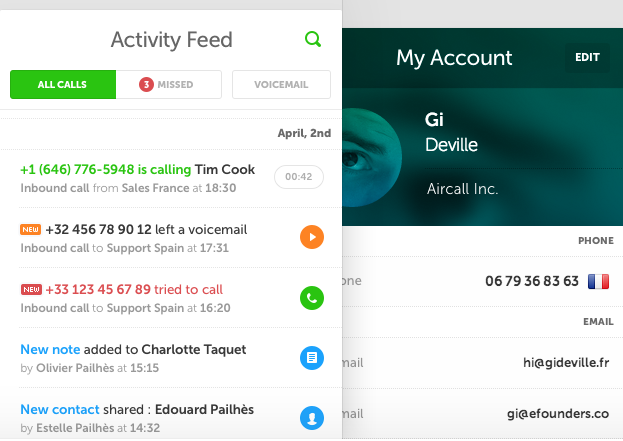 Other rivals like Grasshopper or Sendhub do allow for business use, but have a slightly different focus – Grasshopper focuses on routing cell phone calls (AirCall wants to replace your landline too) and Sendhub is more closely aligned with the messaging space, Pailhès adds. In volume, our market is still in the hands of incumbent telcos with more traditional solutions that are not manageable online, in real-time and that come with contracts and commitments etc. Ultimately, Pailhès thinks the software approach will win out, and he’s clearly not alone in thinking that; the company already has more than 100 paying startup and education business users despite still being in beta. Although still not at official official launch stage yet (that’s planned for the end of this year), there’s a 14 day free trial you can check out. After this, there are two paid plans: a fairly limited $6 per month plan and one that costs from $24 per month. Of course, being a loyal TNW reader does pay off too – you can get a 50 percent discount for your first paid month after the trial by using the promo code TNW2014.